Twitter co-founder Jack Dorsey was the first person ever to tweet about his lunch. In the early days of Twitter, people really did tweet about their lunch a lot: At least 22,773 times in the site’s first year, vs. fewer than 17,000 about dinner and a mere 7,248 about breakfast. 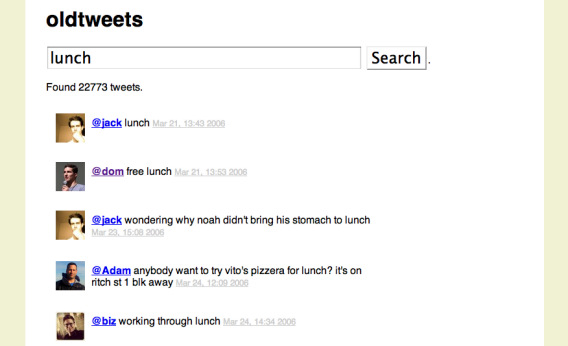 Co-founders Jack Dorsey and Biz Stone both tweeted about their lunches on the site’s first day, March 21, 2006. I discovered this while playing around with a new search tool called oldtweets, which has archived and indexed (all of?) the tweets from Twitter’s first year of existence. Based on the few queries I’ve tried so far, oldtweets seems like both a fun nostalgia machine and a trove of historical trivia. (Yes, 2006 counts as history in Internet years.) And who wouldn’t like to return to a time when there was no such word as hashtag? Try oldtweets yourself here. Find other good ones? Post them in the comments below.